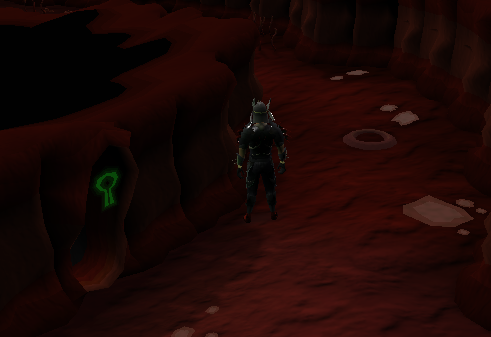 The Abyssal Space area is a special area of RuneScape, which was released along with the Zamorak Mage Miniquest. It's a more dangerous, yet faster way to Runecraft. 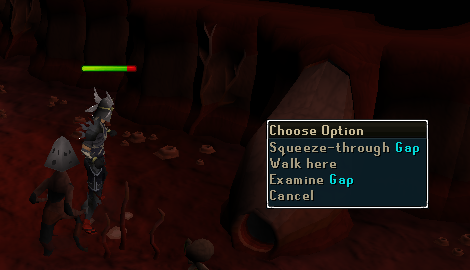 To get there, simply complete the mini-quest and the Mage of Zamorak near the Edgeville Wilderness Mine will teleport you. There are 2 sections to the entire space, including an outer ring where the Abyssal creatures roam, and an inner ring where different ways of passage can get you inside to safety. Beware, however, that these creatures can be quite aggressive and you may find yourself out of certain resources you would normally need. 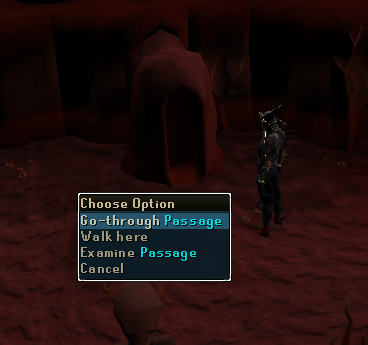 The danger in the Abyssal Space starts out when you get teleported there by the Mage of Zamorak. Before the Evolution of Combat update, your player would normally get skulled. 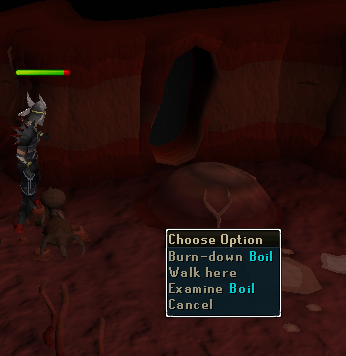 Skulls have been removed and death in the wilderness or abyss may result in you dropping all of your items. The other danger is that your Prayer will be drained to nothing. If you wish, you can bring Prayer Potions to restore some Prayer, but it's not recommended to waste Prayer Potions since some food can easily heal the damage. Whether you're going to the Abyssal Space to fight the Abyssal creatures, Runecraft or just check it out, it's advised to bring some form of teleportation such as Runes or an Amulet of Glory. These leeches are small yet aggressive as they have a high attack speed and can deal small amounts of damage in large amounts on you. Their max hit is 208. These strange creatures with triangular box-like heads can hit fairly high hits (up to 228) and can be very aggressive as well. These walkers have large heads similar to that of dust devils and can be very mean, hitting up to 275. Elemental Talismans will grant you access to each of the 4 Elemental Runecrafting Altars. They also drop Abyssal Charms to help you summon Abyssal creatures. Like the Demon family, these creatures will turn to ashes rather than bones once they die. Another dangerous aspect of the Abyss is that there will often be Player Killers (PKers) waiting near the Mage of Zamorak. A suggestion of armor to bring into the Abyss is dragonhide. It is affordable, light-weight, and provides protection from Ranged and Magic attacks. If you spot a PKer waiting east of the Mage, you can loop around the creek by using the bridge east of the small jailhouse and head up the creek on the east side to teleport to the Abyss before the PKer attacks. This does not always work however. 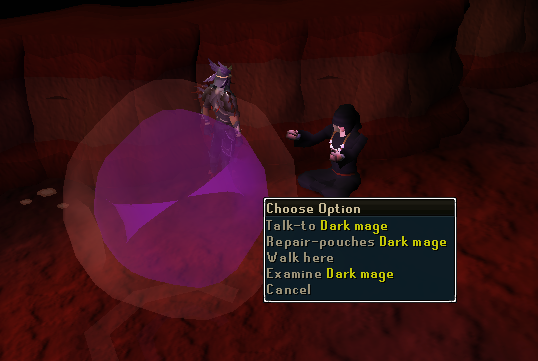 Mage PKers can spot you and Entangle you before you are able to reach the Zamorak Mage. There are 5 different methods of getting from the outer ring to the inner ring. These are generated in a random order every time you enter the Abyss and will not be in the same place every time. Along the inner wall of the outer ring, you will sometimes run across a large boil which you have the option to burn it down. In this case, the tinderbox in your tool belt will help you. There will also be tendrils that you can find against the wall. They are tall, swaying tendrils which look like discolored kelp. In this case, the hatchet in your tool belt will be useful. Along with the boils and tendrils, you will also find rocks. Your tool belt will provide you with the pickaxe you need to mine these so you can get into the inner ring. You will also notice large, strange Eyes on the ground. They can only be distracted with a good Thieving level. 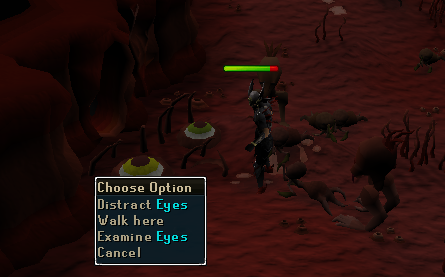 The lower the Thieving level, the higher the chance of failing to distract the eyes. There will also be large objects similar to the Abyssal Walkers' heads. There will be gaps here that you can squeeze through if you have a high Agility level. If you don't have a high Agility level, squeezing through the gap is not recommended. There is also a passage way that you can simply walk through which is convenient if you are not near any other means of getting into the inner circle. Once at the altar, the portal will not take you to the Abyss but outside the Mysterious Ruins the altar corresponds to, so the quickest way to continue crafting at the Abyss is to use an Amulet of Glory and teleport back to Edgeville. You could also use the lodestone teleport to Edgeville, although this takes longer. Many Runecrafters who craft through the Abyss usually have more than one Amulet of Glory so they will not need to waste time charging it. Tip: At level 47 Construction, you can mount a Glory Amulet in your house, which has infinite charges. Just bring a Glory Amulet and 3 Teak Planks to your quest hall. 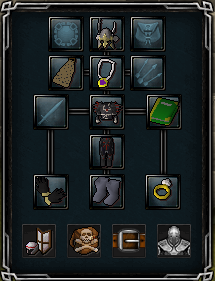 So you can craft your runes, teleport to your house, then Glory-teleport to Edgeville. It may be a bit slower, and you lose a few spaces to hold your Essence, but it costs much less than the "old fashioned" way. A common misconception among runecrafters is that a Tiara or Talisman is needed to craft in the abyss. This is NOT true. You will not need a Tiara/Talisman and people sometimes lose Talismans/Tiaras to this. When you enter the altar rift, you will pop up right into the altar. You will find the Dark Mage, and initiate of Zamorak, floating above the ground in the center of the Abyss providing a link between the Space and the normal RuneScape world. He can fix your degraded or damaged Essence Pouches, and he can also replace your Abyssal Book if you happen to lose it. 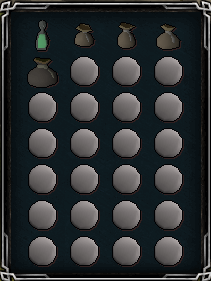 Ectophial/Teleport Tablets/Elf crystal - These are your escape teleports for teleporting when a PKer attacks you. Teleport runes are not suggested as they take too much space, but you can take them if you don't have one of the items suggested. Pouches - All the pouches you can use. Farseer, Archer, Moonclan Helm, or Mystic Hat - Good magic and melee protection.You can replace them with any hat with good magic bonus. Amulet of Glory - To teleport back to Edgeville. You could alternatively use the lodestone teleport spell. Spotted/Spottier, Legends or God Cape - Good magic protection.If you loose your god cape you can get it back by praying at the god statues at the Mage Arena. Legend capes are bought from Legends guild for few hundred gp. The Spotted or Spottier capes will decrease your weight, allowing you to run for longer periods of time. Any Type of Dragonhide - If you want to make money from runecrafting you should think about getting a high range level. Boots of Lightness - Makes you running energy last longer by reducing you weight.If lost they can be retrieved from the Temple of Ikov. Can be replaced with Wizard/Mystic boots. Ring of Life - May teleport you to Falador/Lumbridge you if you have less than 10% of your maximum Life Points. Can be replaced with a Ring of Duelling in case you forget your glory and need to teleport to a bank. Elemental Shield or God book - Good magic protection. The book must be full. You can get one back by talking to Jossick at the Lighthouse. Dragon/Rune Pickaxe - For mining the rocks in the abyss. Can be replaced with weaker pickaxes. Can be put on toolbelt. If you enjoy training the Summoning skill, you may find using the following familiars useful in your training. The Abyssal Lurker (level 62 Summoning), Abyssal Parasite (level 54 Summoning), or Abyssal Titan (Level 93 Summoning) will carry 7 extra essence for you, slow the rate of your prayer drain, and even fend off some of the monsters attacking you in the outer ring. There are also familiars that cannot carry essence but can help in other ways. The Spirit Terrorbird (Level 52 Summoning) can hold extra food, up to 12 spaces, and the Tireless Run scroll will help you run for longer periods of time. Bull Ants (Level 40 Summoning) provide a similar service, except they hold 9 items. Geyser Titans (Level 89 Summoning) are useful for charging your Amulets of Glory, rather than having you go all the way to the Heroes Guild to do it. This is also useful if you only want to buy one amulet and never have to switch, as many players carry multiple amulets. Fire Titans, Moss Titans, and Ice Titans (All requiring level 79 Summoning) will help defend you and can even restore some health. PKers can't kill you unless you get teleblocked and can't escape. If you see a PKer that can attack you, try to teleport to the abyss before it attacks you. If it attacks you, teleport! 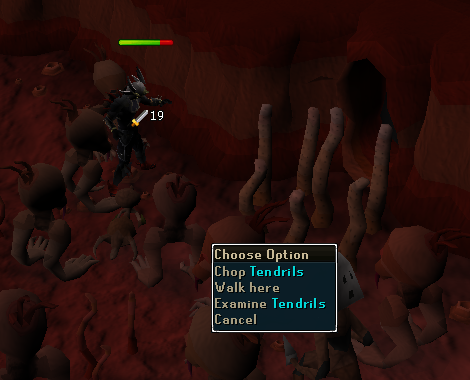 If you got teleblocked, run outside of the Wilderness or teleport to the abyss via the Zamorak Mage as the teleblock can't prevent the mage from teleporting you inside. Its entangles will probably splash because of your mage defence bonus is high. Don't be afraid to wear some armor, as there is a very low chance to get killed in the abyss. Do not wear just the Dragonhide and Glory Amulet because you'll probably get entangled and then killed very easy. If you happen to die, which is less likely to happen unless you lose connection in Wilderness, the costs of replacing your armor are about 100,000gp, which isn't very much. Don't be afraid of risking 100,000gp - pouches are very difficult to get and you'll regret not using decent armor. 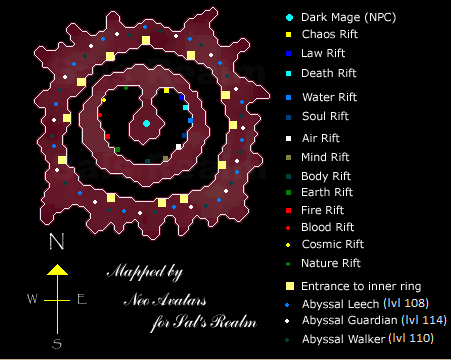 If you're crafting Nature, Death or Law runes you will notice that the rift is in the north part of the circle. This is very convenient as those are probably the most popular runes to craft. It might be a good idea to carry multiple amulets of glory, especially if you cannot use a Geyser Titan to charge them for you. This is so that you don't have to run to the Heroes Guild and charge it all the time. Even then, you'll want to carry as many as you can so that charging isn't always an issue. If you craft on popular Runecrafting worlds, such as world 36, you may be able to use another player's Geyser Titan. Travel light. If you have a high Defense or Constitution level, you can get away with not bringing Dragonhide armor. You may eventually need some pieces of food but will not take heavy damage. If you see a PKer, you might want to teleport as quickly as possible. Don't even bother checking their level or gear because in this era of the game, it is very possible to get snared or teleblocked and 1-hit in seconds. Teleport, log out, and find another world. Do not underestimate a PKer. Better safe than sorry. The above tip is mostly important because you have the chance of losing all of your items if you are killed, as there are no more skulls. Once you are in the Abyss, your prayer will be drained upon entry. If you choose to bring prayer potions, remember that your prayer will be drained again the next time you enter. Also, protection prayers no longer provide 100% protection. If you are a very low level, you may want to consider bringing a couple pieces of food if you don't mind exchanging essence spaces for health. 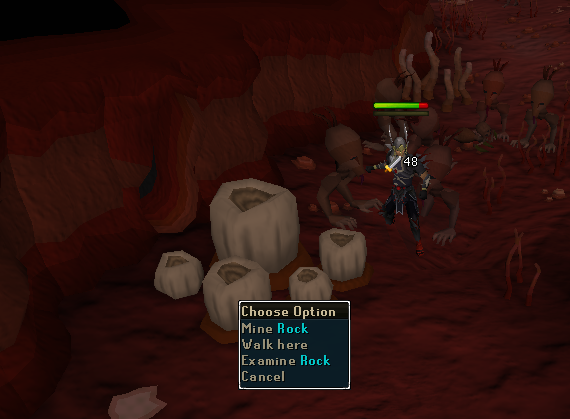 The point of the Abyss is efficient Runecrafting. If you can avoid using the Abyss because of your low level, do so or train your defense at least to withstand the damage. It will be worth it in the end.